Information on your pet's recent visits. View/Print a copy of your pet's vaccination record for boarding, grooming, traveling, or any other reason you may need them. Set how you prefer to receive information about your pet's reminders and appointment confirmations. You can choose to receive postcards, emails, and/or text messages. Through Petly, you control the flow of information. Update your contact information. If you change your address or phone number, we will be notified to update your records. 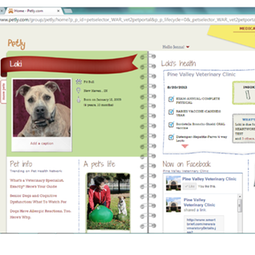 Access to veterinarian-approved medical information on health conditions. If you would like to learn more about a health condition, you can search from your pet's Petly page to ensure you are receiving the most accurate and up to date information. You can also request an appointment through your Petly account and reminder emails! Feel free to ask any of our staff if you have questions about your Petly Page.